Sunday shone creating optimal conditions for riding. 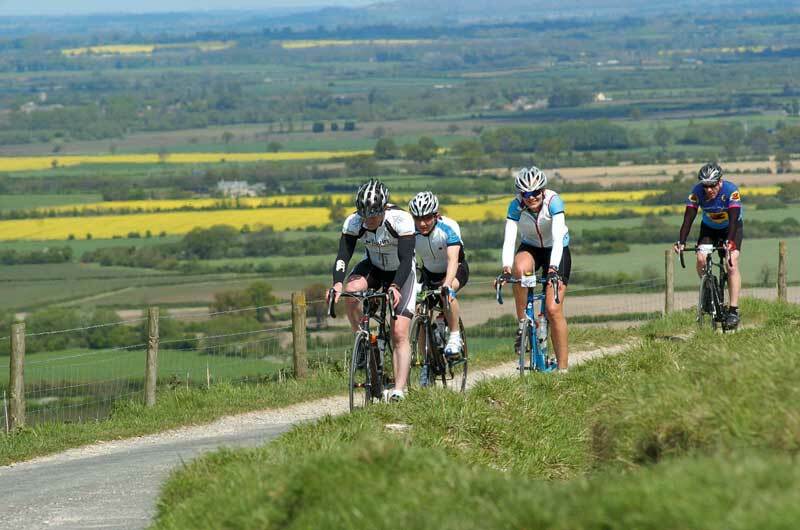 Wiltshire provided the back drop for 500 participants to tackle 150 kilometre tour of the white horses. As the early morning fog lifted, a crisp spring day revealed itself for the third year of the White Horse Challenge cyclo-sportive. Pegged at 150km this ride is not for the timid. Climbing past four of eight known white horses, crossing three counties, incorporating 1,400m of climbing, legs felt drained afterwards. Despite offering room for 600 entrants, the event was a sell-out by the end of January. Slick organisation at registration and electronic timing devices that fix to your front wheel made this event feel like a bigger European sportive. Cyclists were ushered out the start chute with friendly cheers, before tackling a relatively flat the first 40 kilometres. Riding in a bunch helped to punch into the headwind. 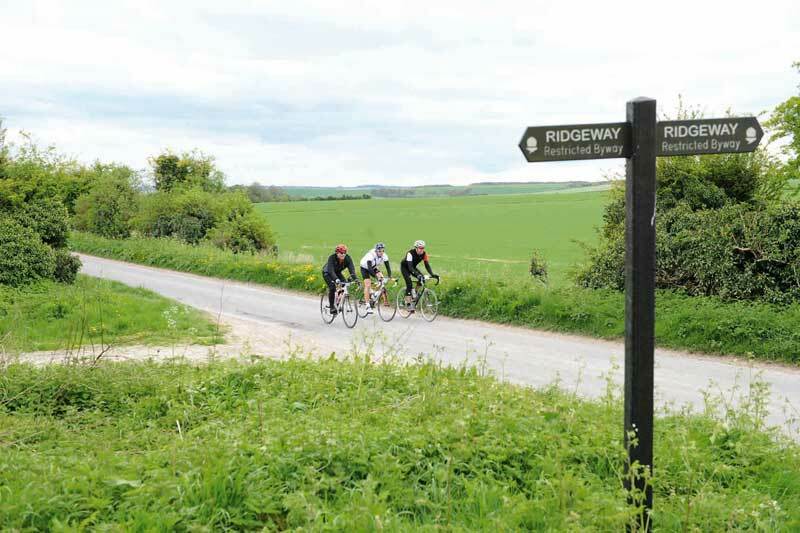 As the name reveals, the route takes riders up and over four white horses – Uffington, Broadtown, Cherhill and Hackpen, each with their own unique climb to break the joining country roads. Dominant in the hillside the horses have been cut into the turf to reveal the chalk beneath. Each addition has been created through the centuries to commemorate many occasions, ranging from Queen Victoria’s coronation to local shoemakers and schoolboys being creative. Rolling relief was found between horses and Avebury’s Neolithic stone formations gave riders something to ponder as the countryside passed by. Chugging up to heights gave crisp spring green views of Marlborough as riders rolled thorough quiet, smooth country roads. The last section played mind games with riders as their legs tired, it seemed relatively flat and the end was in sight. Then there it was, the last climb to drain anything left and more, Dragon Hill, where most volunteers reported hearing a lot of swearing. Luckily the aid stations were stacked to the brim with cakes, energy drink and helpful people. 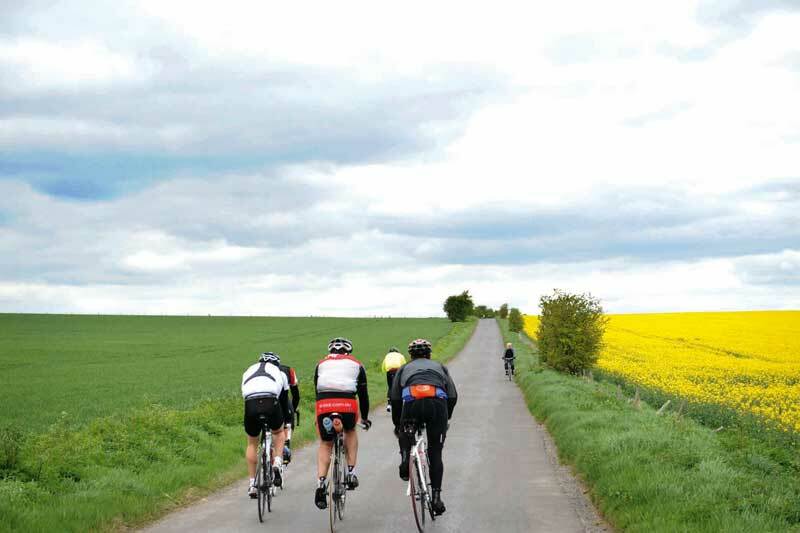 This is not a ride of killer climbs like some sportives found on the calendar, but the sheer distance and speed that can be had on the flats makes this a tough ride that leaves riders lying in the sun eating cakes with a glow of satisfaction. Riders can feel not only pleased with their efforts but with the support they have given to charity. Organisers of the event donate all proceeds to WaterAid, who work closely with them to make the day a success. Riders are encouraged to raise funds for the charity, which funds the provision of safe water, effective sanitation and hygiene education to the world’s poorest people. The top three fund-raisers are awarded a £100 voucher for local Big Adventure Store. I feel very happy about this year’s event and I believe it gets a little better every year. This year we made some minor tweaks based on rider feedback from the previous two years. The success of the Challenge is based on three key factors, the marshals who that give up their day to make it happen, the riders who take part and the people who support the riders as they pass. This was deceptively tough. The climbs don’t so much smack you in the face, as sneak up behind you and nick your energy on the undulations while you’re enjoying the sunshine with your mates. Then, by the time you hit Dragon Hill in that last few kilometers, you turn around to spend your last few kilojoules of energy and find yourself confusedly slapping your empty back pocket, followed by frantic dig around in your legs for your last bits of currency to get the night bus home. A well-marshalled route, perfectly adequate organisation, ample parking with ease of access and some much appreciated sunshine. A brilliant start to the season! An absolutely stunning route with cheeky climbs, lovely atmosphere and great organisation. As my second sportive, it was a great introduction to what sportives are all about. I thought the organisation made my calmed my nerves with easy registration and a great timing chip device on your wheel. The road markings and marshalling were very clear and the feed stations hit the spot. The White Horse Challenge has left me inspired me to enter more sportives. Organisation was brilliant from the start of registration, during the ride, right through to the premature end of my day. The course was not the most adventurous I have been on yet still challenging. Not having to climb a big hill to start was excellent and having the first 40km flat meant good bunches could form for the day. The climbs weren’t particularly long of steep but the sheer distance between each drained the legs. All the roads were smooth and the route was well marshalled and signposted. Maybe next year I can finish it and find out what Dragon Hill is all about. Overall I have to say I think the White Horse Challenge was my favourite out of the three sportives I have done over the last six months. To be fair the other two, The Autumn Epic and the Hell of the Ashdown, were spoilt more due to the weather than anything else. Overall though I do think the scenery and ride in general for the White Horse Challenge was just more enjoyable. I think the first half was by far the easiest part of the ride, with some more challenging ascents in the latter half. Getting in a bunch at the beginning helped to keep the speed up as the countryside passed by. I managed to see all of the white horses on the route and thought that the route was well designed. The last climb was particularly hard with just 20 kilometres to go before the finish. This was quite hard on the legs after doing over 120 kilometres, further than I had ridden before. I was even more determined to get up this particular climb when I saw several people pushing their bikes up. Not wanting to be in that situation, with a good rhythm and some hard pushing out of the saddle, it wasn’t impossible. I think the organisation of the event was excellent and there was no way of getting lost throughout, even for the most geographically challenged people, like myself. I do think the finish line could have been a little more clearly marked and it would have been good to have a few more drink options at the food stations such as coke and coffee. I would definitely consider taking part in this challenge again. I am motivated to train enough to be able to move from the silver category to the gold as I would be in a minority looking at the ride results. I would only need to take 25 minutes off my time and that is achievable with some hard work and determination.